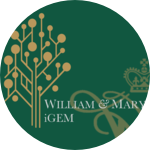 W&M iGEM is a team made up of nine undergraduate students in biology, physics, mathematics, and chemistry. Under the guidance of two faculty advisors and one alumni advisor from the departments of biology and applied science, our group is aiming to create a novel system for improved design of biological circuitry. With your support we will present our work amongst 300 other iGEM teams at the iGEM Giant Jamboree in Boston this Fall.